Analysis: Scott spent the first three-plus months of the season on the Saints' practice squad before signing with the Eagles in early December. The 23-year-old was also active for both playoff games, playing three offensive snaps. Scott is under contract for next season and is likely to be fighting for a depth role come training camp. Analysis: Scott joined the team prior to Week 14 following Corey Clement's knee injury, but the rookie will have to wait at least another week to make his debut. The Eagles will roll with Josh Adams, Darren Sproles and Wendell Smallwood at running back. 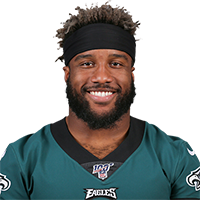 Analysis: Scott, a sixth-round rookie out of Louisiana Tech, will add some depth to the Philadelphia backfield in light of Corey Clement's knee injury. It's likely that most of Scott's initial opportunities with the Eagles will come on special teams, but there's a small chance he can squeeze in work with the offense as the season winds down. There are no videos available for Boston Scott. Click here to view all videos.